Smule, creators of several of the most popular iOS music apps of all time (including early smash hits I Am T-Pain and Ocarina), has been kicking apps and taking names, with over 15 million active users. Smule users have recorded over one billion individual songs using all of the company’s apps. That is roughly five times as many songs as exist on Spotify or any other on-demand service. Its apps have been downloaded over 100 million times. All of these downloads and social activity are translating into real dollars. Smule made $12.6 million in revenue in 2012 (almost exclusively from selling apps in iTunes). Smule expects to bring in $20 million this year. Smule unveiled its latest app on Thursday morning: Guitar by Smule, an iOS app that lets you strum on a virtual guitar along with a vocal recording that another Smule user has already recorded using the Sing app. The company calls this “the first app ever to enable cross-app music creation” — to which regular Evolver.fm readers will respond, “What about Audiobus?” True, but this is a different kind of cross-app music creation, because you’re adding to something another person made in another app at another time. After taking a look at a pre-release version of Guitar by Smule (screenshot gallery and video below), it looks as slickly designed as anything else Smule has put on the market, and indeed, it does take “social” music to a new place by allowing users to play an instrument to what someone else already sang. 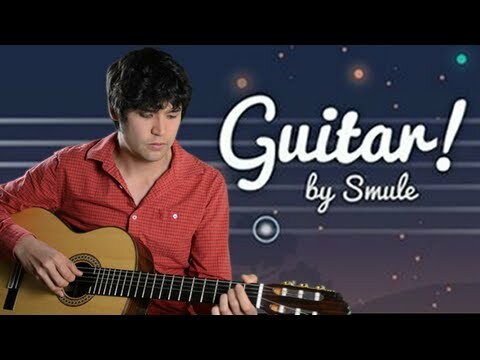 Interestingly, for a company that has made so much money, Smule did not include any in app purchases in Guitar. Instead, everyone starts with 200 credits. If you want to “buy” all the guitars and songs in the app, you’ll need to earn credits by progressing through the songs.